Despite having visited the Royal Tasmanian Botanical Gardens more times than I care to remember, there is always something new there to see. About two weeks back I was looking around one of the native plants section and found an interesting heath (Epacris) planted there. It was the double pink-form of the common heath (Epacris impressa). 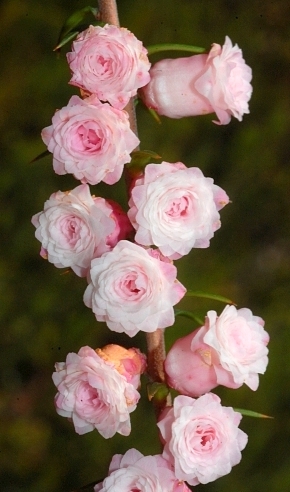 Unlike the normal Common heath with it’s long trumpet-like flowers, this interesting form shorter corollas and rose-like petals, not unlike the widely cultivated double rose-form Camelias we see in many gardens. How exquisite! I wonder how this form came about. This entry was posted in Plant Morphology, Shrubs and tagged Common Heath, Epacris impressa, Epacris impressa double pink-form, Ericaceae, Royal Tasmanian Botanical Gardens. Bookmark the permalink.